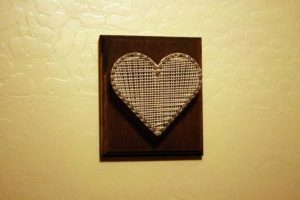 If you want to learn how to make string art, this article will teach you the basic process which you can apply to any other design. 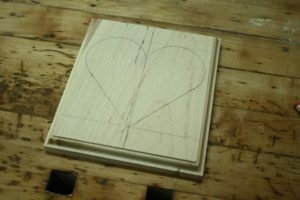 I picked out a simple heart (for my wife) that allows me to show you the method. Apply these same instructions to your design, and you will be able to start making string art very quickly. What does this have to do with woodworking? The base you make for the project is made from wood, and requires woodworking techniques to create. If you just pound nails into anything, it will not look very good. Combining a little creative art with some woodworking talent allows you to make a very nice looking piece of string art in a very small amount of time. I made this string art project in my shop just this afternoon, and I worked on it in between other projects. It’s nice to have something going on in the background while you are waiting for glue to dry. You will need a box of 1-1/2 inch shiny nails with large heads, a small piece of wood for the base, a stain of your choice, some lacquer, and string to make this project. Most woodworkers have stain and clear in their shops, so feel free to use anything you already have. I chose white string because I knew that I wanted to stain the board dark. You can make your own choice on the color end. If you have a small piece of scrap laying around the shop, this is the project that it was waiting for. I found a piece of Maple, and cut it down to 6-1/2 inches wide by 8 inches long. The measurements for this project are not incredibly important unless you want to make this exact project. Feel free to make what you like, and use this as a guide. I will be demonstrating the measuring and marking out process based on proportions rather than measurements, so you will always have something that fits well, no matter what size piece you decide to use. 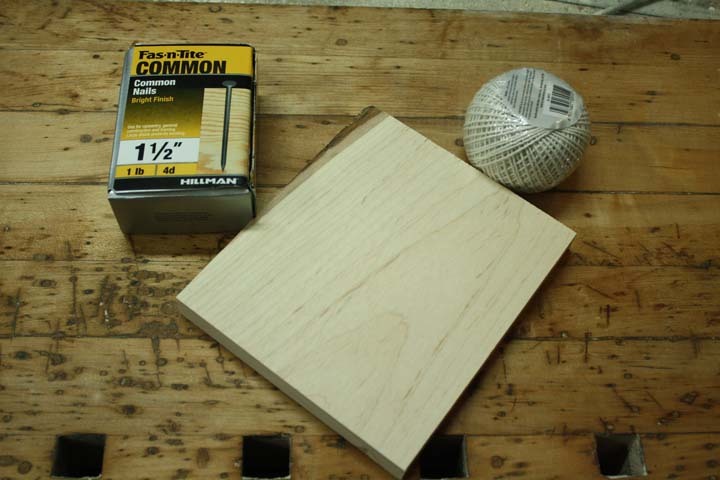 Next, create a profile around the four edges of the board. I really like the look of an Ogee pattern, which is why I used it for this project. A different pattern will work as well, so take a look through your router bits and decide. I used this same pattern on my DIY Established Sign. 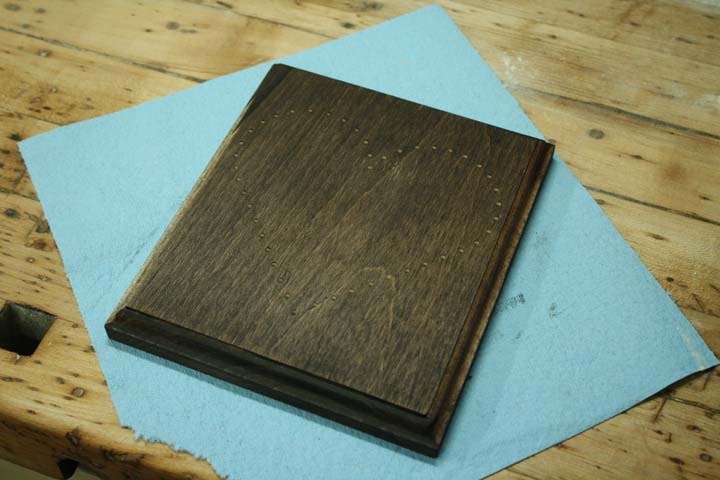 If you do not have access to a router, you can simply round over the top four edges with sandpaper. This will give the piece a completed look, though not as fancy. 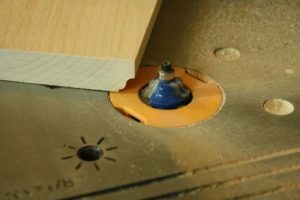 Be careful when using the router table, as the wood can be pulled by the bit. I like to take several light passes until I reach full depth. This way, the bit is only digging into the wood a small amount. You will get much less pull this way, and it will be safer too. Here is what the nail art sign looks like after being routed. The simple addition of something around the edges makes a difference. Again, choose a different route if you desire. After you finish your edges, go over them carefully and look for defects. Sometimes the router can burn small sections of wood. This is easy to remove with sandpaper. Another thing that happens once in a while is a chip will come out. You can fill the chip, or sand to blend it into the surface. If you like a rustic look, a few small chips and dings will only add to the overall look. A lot of the places that teach you how to make string art will have you lay down a drawing of the design, and poke holes with nails to transfer it to the surface of the wood. This is a good plan for harder designs, and can save you a lot of time. All you do is tape a picture of what you want on the wood, and poke holes at regular intervals following the lines. For this design, I used a simple heart pattern, which was easy enough to draw myself. Find the center of the board and draw a vertical line. Then, draw two horizontal lines an inch from the top and bottom of the board. Finally find something round that you can use to make a couple circles for the tops of the heart. I used a spray can lid. It just has to fit between the center line and the edge of the wood. I kept mine about half an inch from the edge. Lay the round object so that it touches the top line and the center line, then trace around the piece. Repeat this on the other half of the design. After that, use a ruler to connect the intersection of the bottom and center lines to the lowest point on the circles. Once you make these marks, you can erase everything inside and you will have a very easy heart shape. Now, all you have to do it make small marks across the line every 3/8 inch. I decided on 3/8 inch marks because of the heads on the nails. You need a small gap in between them, and this spacing left about 3/16 inch in between each one. Having a little space to work with allows you more freedom to wind the string, which will become important later. Now that you have your marks, make small indents with a sharp awl or screw head. All the places that you made a mark on your design will need to have an indent made at the intersection. Here is where the real secret of how to make string art is revealed. Most people look at these designs and think that someone was hammering nails into the surface for hours. While this would work, it’s not the best method. Step three will show you how the professionals do their string art. This one little trick makes the project look far more even, is much easier than hammering nails, and you get a much better final product. That’s the trick. You are not going to be hammering nails into your piece, you are going to drill holes that allow the nails to stand up straight and even. 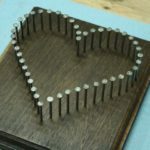 This is best done on a drill press, but if you are careful and take your time, you can do it with a hand drill as well. Use a caliper to measure your nails. If you do not have a caliper, drill a few holes with small bits and test the fit. You want to find a drill that is only slightly smaller than the diameter of the nail. The goal is to be able to easily hammer in the nails. You need the hole to be tight, but not so tight that you cant even start the nail by hand. 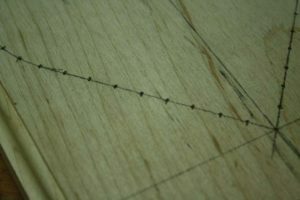 Once you have selected your drill, go through each mark until you are about 1/8 inch from the bottom of the board. For a 1-1/2 inch nail, this will give you a lot of play. If you want the nails taller, you can do it. If you want them shorter, you can do that too simply by hammering them in farther. Now that the design is made and the holes have been drilled, it’s time to stain and finish the string art base. 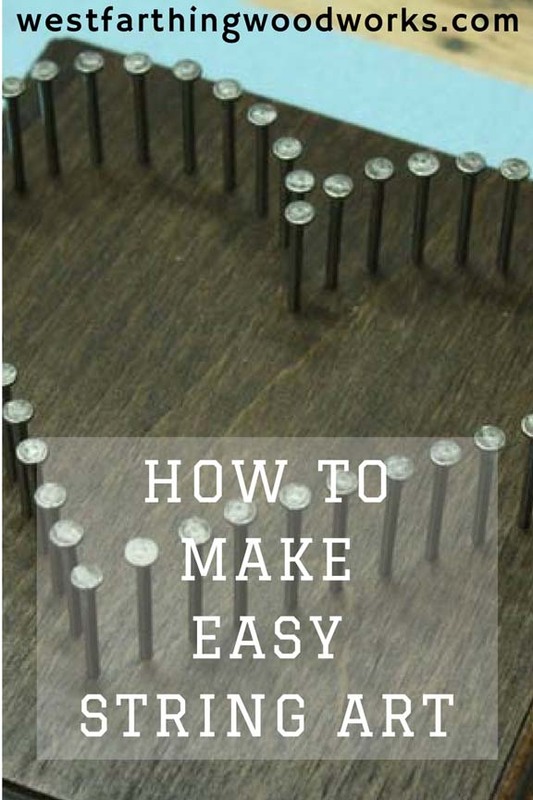 This is the best method of how to make string art, because you get the hard parts out of the way first. First, sand off the marks from the layout using sandpaper and a block. Work with the grain, and then clean off the surface. Also, blow out the holes to remove any excess saw dust. After that, stain the piece using a color of your choice. For this project, I used the Kona color of Rustoleum stain. I really like these stains. They act like a gel stain, and allow you to wipe it around to even out the coloring. Allow the piece to dry according to the can, which for mine was one hour. Next, apply a light coating of a clear sealer like lacquer or polyurethane. 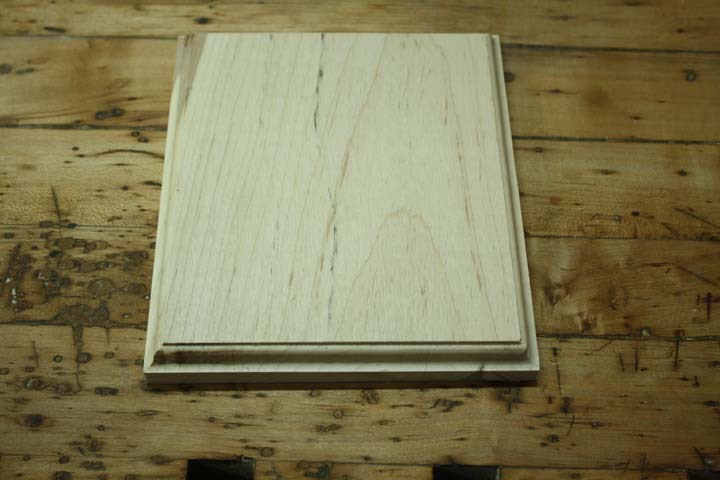 This will trap in the stain layer, and make the project have a nice even sheen. Set the string art base on a small block, and then spray light coats. I like using nicer lacquers like Mohawk or Deft, because they coat better and dry faster. One thing you could really do if you are normally using inexpensive hardware store lacquers is to upgrade to a nicer brand. Not only do they dry better, they also lay down flatter, spray easier, and re-coat faster. The small money difference is well worth the difference in performance. The staining and lacquering portion of how to make nail art is optional. However, it will give your piece a more complete look. Some people like the look of unfinished wood, and if that’s you, select a good contrasting string color and you won’t have to add a finish. 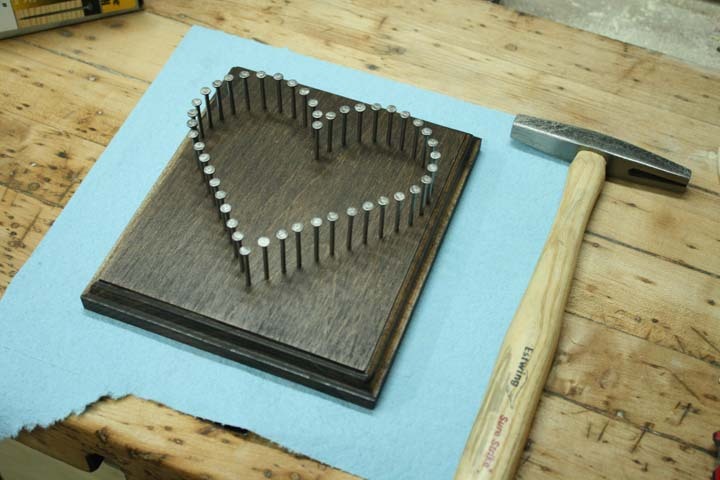 Now that your string art base is dry, it’s time for the nails. Since you already drilled holes, this part of the process will go very easily. Start in any part of the design, and begin adding nails one at a time. Follow your holes, and pound them all in to the same height. Once you get them all in, look at the heads from the side and see how even they are. 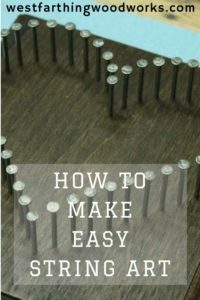 If you need to make adjustments, pound in the nails that are sticking out too far. Look at the side again, and repeat the process until all of the nails are the same height. You can also turn the piece upside down on a flat surface and look for nails that are too tall. Don’t worry about getting this down to the millimeter. As long as they are close, the design will work out perfectly. Next, it’s time to wrap your string. There are many different ways to do this. Some people like the random crossing and back and forth method, and some like regular lines. I personally like straight lines (I know, I’m not very creative) so I decided to go back and forth one way, then do another back and forth perpendicular to that. To wrap your string, start by tying one end to the lowest nail. Tie a good strong knot right under the head. Then, simply wind the string around each nail as you go up and down across the piece. 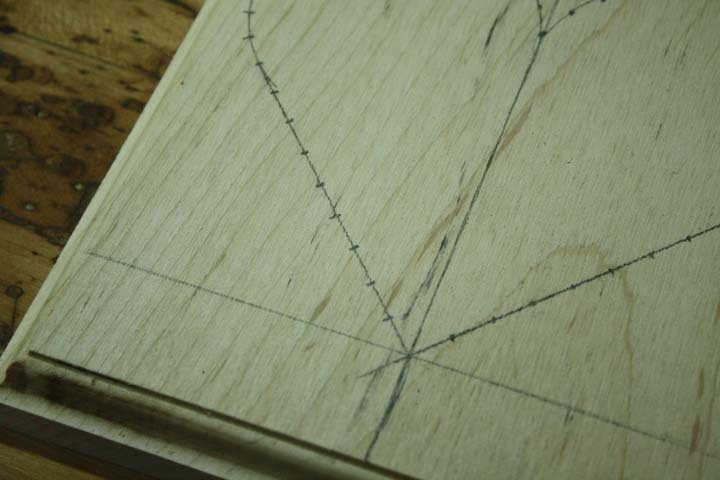 This will create a pattern of vertical string lines on the heart. Next, do the same thing but going side to side. Any time you need to move from one area of the design to another, wrap string around the outside of the design until you get where you need to start your next run. Finally, wrap a few layers around the outside to frame in the design, and tie off the end. All you need to do from this point is hammer a saw tooth picture hanging clip to the top of the back side, and you can hang it on the wall. If you prefer another method of hanging your work, you can add that instead. I like the saw tooth hangers, because they are cheap, and easy to install. There you have it. How to make string art the easy way. Now all you have to do is head out in the shop and make it. All the reading in the world is no substitute for actually making things in the shop. Go on out there and have some fun. If you come up with a cool string art design, send me an email and I may share it with everyone on the website. 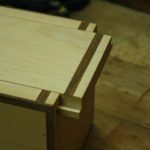 I love seeing people become successful at woodworking from my help. If you make something beautiful from my tutorial, I would love to hear about it. 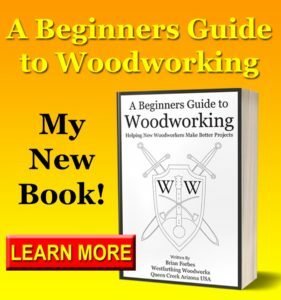 If you like the way I explain things, my books go into even more detail on specific woodworking subjects that you may enjoy. 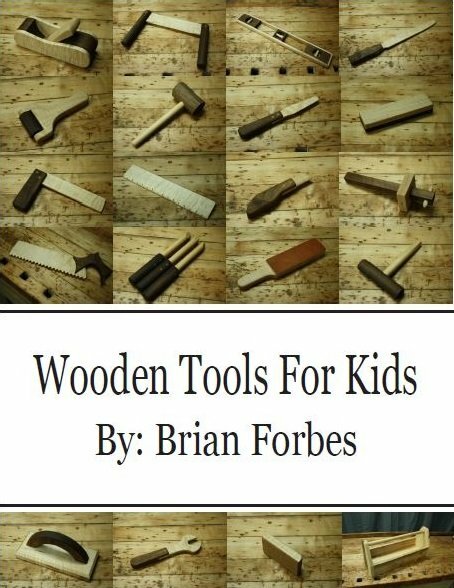 I have two woodworking books, one on making wooden rings, and the other on making toy tools for kids. 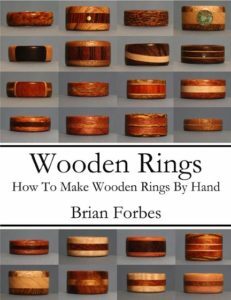 is a great way to learn how to make rings easily, and without many tools. Having been a woodworker for a long time, I have a decent tool selection. 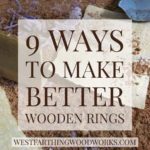 However, not everyone interested in making wooden rings has all the same stuff. With that in mind, I wrote this book using the bare minimum tool set. If you own different or better tools, you can easily substitute them along the way. For example, I show how to hand sand the outsides of the ring, but if you own a belt sander, you can use that too. Most people who want to make a ring are doing so for a gift or for themselves. This book shows step by step instructions for a wide variety of rings. There are also examples of nearly 50 beautiful rings to use as inspiration along the way. 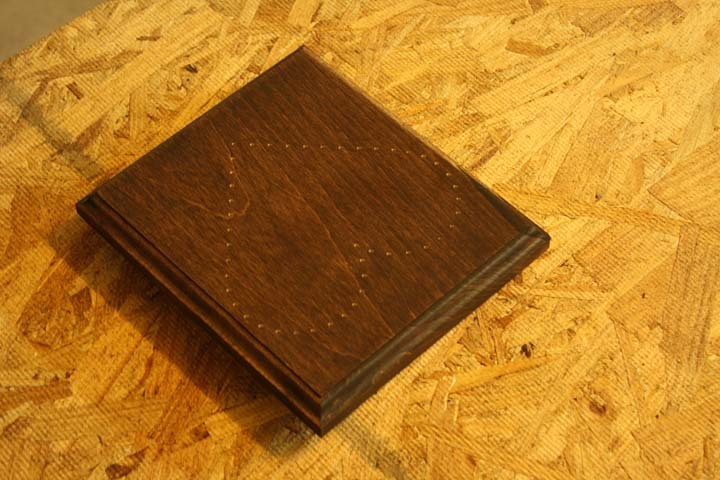 There are also chapters on inlays, and finishing. Once you finish the book, you will be able to make a beautiful ring for a thoughtful gift. Most people that make a ring go on to making several more. They are fun, easy, and inexpensive to make. came out of my desire to make an heirloom toy tool set for my son. My tiny boss dictates many of my woodworking projects now, and I really enjoy making things for him. 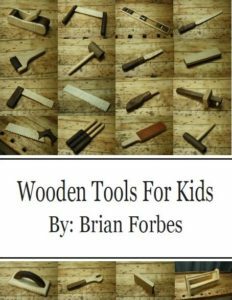 The book has full instructions for over 20 wooden toy hand tools, and a farm style tool box. Each tool is presented in a step by step manner, and they are all very realistic. Wooden toys encourage the imagination of a child in a way that modern electronic toys do not. With all his other toys either beeping, clicking, or playing terrible music, I wanted to give him something that encouraged him to think and imagine. I truly enjoyed making these toy tools for him, and the set in the book is the exact same set he plays with now. It was a joy giving all of them to him, and I am sure you will feel the same way if you make the set. If you ever want to feel truly appreciated as a woodworker, make something for a child. The feeling you get is truly amazing. If you have any questions on How to Make String Art, please leave a comment and I will be glad to answer them. Also, please share my work with your friends on Pinterest! Thank you for the clear and understandable instructions for string art. This is exactly what I was looking for. I wanted to figure out how to make a more solid string art, not made of cardboard, which is unstable, and the pins get pushed out, ruining the project. Thank you so very much! You are welcome Jean, if you have any questions about the process feel free to email me and I will give you a hand. Thanks and happy building. Hello! I want to make string art so I can teach my Grandson. That way he can make gifts for his teacher’s. My husband is into farming so he does not have the type of tools we will need. I did insist that he supervise two Grandson’s making a huge planter for me, while I taught the girls to sew this summer. Are the tools very expensive? We do have a hardware store in town, but we live eleven miles from town. Will it take long to sand a board as my Grandson has ADHD, so I have to keep him on task. 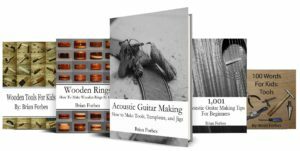 Do you have a book for making toys for children? He would enjoy making toys for younger kids who don’t have much. I hope to buy you String Art book next pay day, but thank you for the articles so I can get started buying what is needed. Thank you Cynthia. If you want to make the process a little easier, you can buy a board from a craft store like Michaels that is already routed and sanded, and that will take a lot of the work out of the process. If you want to hammer nails the old fashioned way rather than drill for them, it can add a quaint handmade charm to the piece especially when made by a child. This can save you on tool costs. 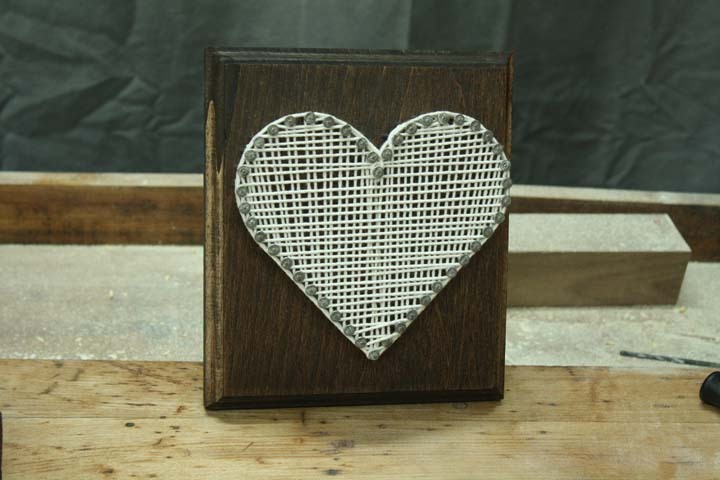 I do not have a book on string art, but I do have one on making wooden tool toys for kids. 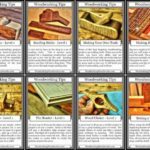 You can find the link and the picture in the sidebar of the website. 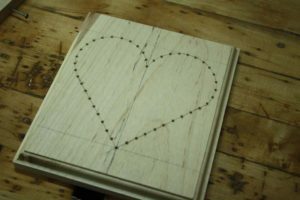 I will say that the kids tools book does require more tools than the string art does, so browse through a little online before buying the book just in case you are not ready for that yet. Best of luck, and please email me if you have any questions. Happy building. Beautiful string art with clarity. Hi!! I am sooooo excited to do this. Just have one Q – what do you mean by a wide head for the nail? Is 1/8 inch enough? Or should I try to find nails with a wider head? Thanks!! Thank you, look around for nails where the heads are noticeable larger than the shaft. It’s a lot easier to wrap the string, and it won’t pop off as quickly. 1/8 might be a little small, but if you are using thin string then you will be fine. Happy building. Hello, I want to thank you for the instructions on how to do string art. I am looking at doing 3 projects for Xmas and I am trying to figure out what size of nails I will need and how far apart do you put your nails? I don’t have the drill press but I do have a drill can I just use it to drill the holes if so how do I know how far to drill them in? Would it look good if I just nail them in instead. I just need someone who knows about string art to give me their opinion as what would be best for me to use and do to make my projects look their best. Also is there a special hammer that is best to use? Thank you again. Thank you Larice. You can use any nails you like as long as they have at least a little bit of a head on the top where the string will not slip off the shaft of the nail. You can use your hand drill, just be careful to keep it straight up and down. Also, you don’t need to worry too much about spacing, just get the nails tight enough to outline your project nicely, maybe around 1/4″ and you can play with a wider or tighter spacing. As long as you can make a nice design, you are doing the right thing. Finally, you don’t need anything fancy to set the nails. 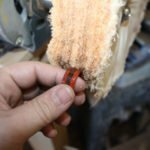 Put some tape on your drill bit so you drill the holes the same depth every time, and then tap the nails into position using any hammer you own. Hello, thank you so much for these very easy to follow instructions, and great tips too. I just started my first string art project and had some difficulty with all the nailing, so many nails, my goodness! And after completion of getting the nails in, I’m a little disappointed of how crooked the nails are, after trying my hardest to get them as straight as possible. Anyways, I was wondering if you might know of a nail gun out there on the market that allows you to gage how far in the nail goes so you don’t go all the way through the wood, and of course to make the nails straight. Thank you Katheryn. I know it can be frustrating hammering the nails by hand. I felt the same way in the beginning. Though I have experimented with the nail gun idea, I could never get it to be consistent. It was also a little rough, because the blast sends the gun backwards, and brad nails are a little soft too. You also need an air compressor, lines, fittings, and setup before you can use a nail gun, which not everyone has. On top of that, the nails are really bendy, meaning I don’t thin k they will hold up well against all the pressure from the string. You would be much better with a small drill press, which you can find for about $99. You might also be able to get one that is second hand by looking online. My drill press is older than I am, and it’s been a perfect tool for a very long time in my shop. Once you have a drill press, you will wonder how you ever did without it. I promise. Happy building, and feel free to email me or comment if you have more questions. I love to help. Thank you so much for giving such good tips and instructions on making string art! I really want to give it a try and hammering nails straight into wood isn’t my forte. Drilling the holes first just might be the trick I need! Thank you Lorraine. I’m glad I could help. You will love the way your string art looks once you start drilling the holes. Even with a hand drill you can still get a really good look. Just go slowly, keep your drill as straight as you can, and tape the drill bit so you know where to stop each hole. Happy building.